SUBCONTRACTED WORKERS have reacted angrily to comments made by President Recep Tayyip Erdogan on Friday when he was on an election campaign trail in the central city of Sivas. Erdogan said his governing party, the AK Party (AKP), is properly paying its workers and even those in government business enterprises (KIT). The comments left many workers disappointed. Reacting angrily to this, subcontracted workers loudly said they are no “provocateurs or terrorists.” The workers are demanding to be permanently included in the government payroll as they currently don’t have any benefits. Subcontracted workers in Turkey have no guarantee of a permanent position as their contracts may not be renewed at the end of a deadline and they have no option to be retired with state benefits. The local elections will be held on March 31 in Turkey. A 2017 presidential decree prevented these workers from getting permanent employment in government or its associated enterprises. The protesters displayed banners and chanted during Erdogan’s speech, asking to be permanent staff. 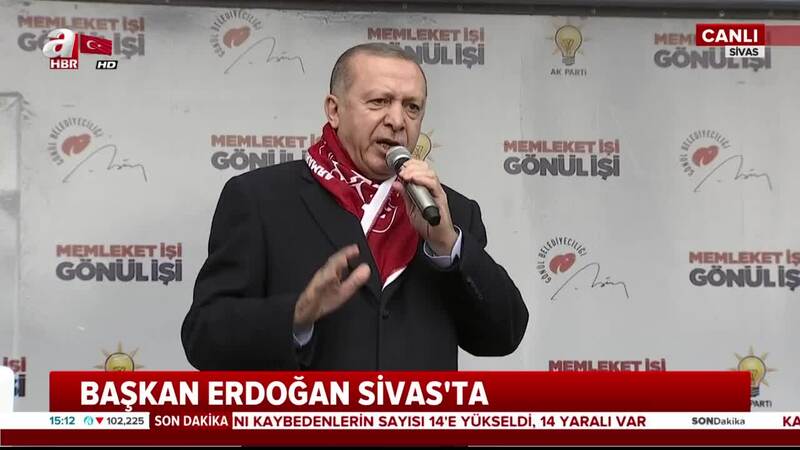 An anonymous protester said to Evrensel daily: “We are neither terrorists nor provocateurs, we are people seeking their rights,” he said after he was accused of provoking Erdogan’s speech. “It would be okay if the President said they wouldn’t do it, no need to lie. Let them show one person who was given payroll employment at KITs. They are playing games with people’s dreams and hopes. When I heard the President scolded us, I cried with anger,” he said. Besides complaining workers, Erdogan also took aim those who are unhappy with food prices. “They are talking about potatoes, onion, and green pepper. George and Hans [Western powers] try to shoot us and they are standing by,” he said. The Turkish President argued the high inflation is a result of their struggle against terrorism, referring to military operations in south-eastern Turkey and northern Syria. “They are mentioning egg-plant, potatoes, and peppers. But think over, how much is a single bullet?” asked an irritated Erdogan, clearly showing high food prices are not his priority. As the Turkish economy continues to fail to grow, nearly 1 million people have lost their jobs between July 2018 and January 2019, according to official data. The unemployment rate in Turkey is now at 11.6% and reached a 19-month high at the beginning of 2019 when the annual inflation hit 20.35%. Seeing the high inflation and prices as part of an economic assault against his leadership, Erdogan urged Turks last month to report stores that imposed unusual price hikes.